The Social Sciences, Humanities, and Arts Research Experience (SHARE) Award is a research apprenticeship program designed especially for students in the earlier stages of their college careers. A SHARE project serves as an introduction to research in a chosen field and helps students develop the skills they will need for further research projects. SHARE awardees spend 10 hours per week during the Spring semester working on a faculty project. SHARE provides faculty members with eager assistants for their projects, allowing faculty members to focus on their own research interests while introducing future researchers to the realities of research in their discipline. Examples of SHARE apprentice duties include, but are not limited to, performing library research, assisting with experiments, coding and/or analyzing data, and conducting and/or transcribing interviews. Funding: During the spring semester, student apprentices will receive a $1,500 stipend (paid out as an hourly wage) and faculty mentors will receive a $500 professional development stipend. SHARE Teams: SHARE teams consist of a faculty mentor and a student apprentice who apply jointly for the program. Faculty members are encouraged to recruit student apprentices to work with them on a potential SHARE project, and students interested in the program may also approach faculty members to express their interest in a potential project. Deadline: SHARE Applications (both the Faculty and Student applications) must be submitted by 4:00 pm on October 28, 2013. Additional program details and a link to the Faculty and Student Applications are available online at: http://ugradresearch.uconn.edu/share/. We hope that you’re planning to attend the Frontiers exhibition this Friday afternoon or Saturday! Here’s a link to the program. We have 218 undergraduate students presenting posters for 175 research projects. STEM fields, social science, humanities, and the arts are all well represented. Many students who are presenting their research have received SURF, SHARE, and other Office of Undergraduate Research awards. The artwork for the Frontiers poster was produced by talented Holster Scholars, Kaitrin Acuna and Julianne Norton. The poster was designed by Mallory Matula. Thank you all! Protestants and Catholics waged bloody wars over doctrinal differences during the Reformation, but an undergraduate research project shows they shared similar views about hell. In a historical study comparing how eternal damnation was depicted in centuries-old religious texts, Alexis Cordone 2014 (CLAS), a religious studies major, found more similarities than differences between the two denominations. During this historical period, when opposing religious powers were engaged in a struggle across much of Europe, such re-publication methods led to a surprising degree of “ecumenical” thought. This continuity “was not what I would have expected for works written about such a controversial topic during the Reformation,” says Cordone. Cordone’s opportunity to examine early printed books in detail and uncover insights into what scholars know about the Reformation period, comes thanks to a UConn program that funds undergraduate research in the social sciences, humanities, and arts. UConn’s Office of Undergraduate Research has taken the initiative to promote and support early career undergraduate research such as Cordone’s. The Social Sciences, Humanities, and Arts Research Experience (SHARE) program encourages a research partnership between a student and faculty member, which exposes the student to research in these disciplines and provides the faculty member with an apprentice for their professional projects. The program was initiated in 2010 by Lynne Goodstein, associate vice provost for enrichment programs and director of the Honors Program, and the then-director of the Office of Undergraduate Research, Jennifer Lease-Butts, to promote research experience in the early stages of students’ undergraduate careers in the social sciences, humanities, and arts. Early career research is also crucial in preparing students in the social sciences, humanities, and arts for competitive research grants against candidates in the hard sciences who have been exposed to research early on in laboratory courses. Clare Costley King’oo, associate director of graduate studies and assistant professor in the English department, agrees that the partnership is a rewarding one. “Training an undergraduate apprentice is no doubt challenging. But the benefits far outweigh the costs,” says King’oo who mentored Cordone in her immersion into Reformation literature. 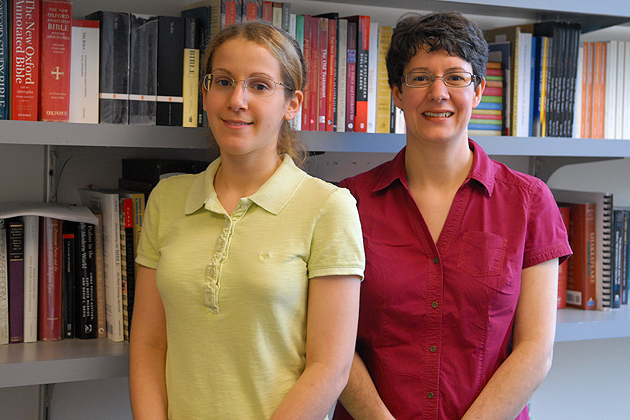 Stephanie Godbout, one of last year’s SHARE recipients, is enthusiastic about the research she conducted with mentor JoAnn Robinson, a professor in the Department of Human Development and Family Studies. Godbout’s project was a study of the relationships formed within the JumpStart program between mentors and preschool children. She too says that the partnership opened her eyes to the research opportunities available in the social sciences. Applications for the 2013 SHARE program will be available for students and faculty on August 30, 2012. Applications are due in October and winners will be announced in December.